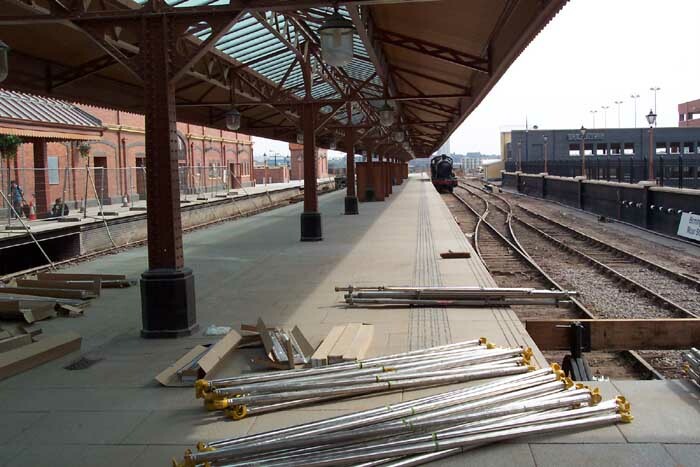 Moor Street station is one of only a handful of the region's stations to be completely rennovated (as opposed to rebuilt) and reopened as part of the national rail network. Originally opened in 1909, the fomer Great Western station was built as a terminus for the North Warwickshire lines to alleviate pressure on Snow Hill station - the station is at the other end of a tunnel directly connecting the two stations - and for goods traffic for which a goods depot was built. With the tunnel link between Snow Hill and Moor Street closing in 1968 and demolition of the goods depot, Moor Street rapidly became a delapidated and overgrown 'forgotten' station in the centre of Birmingham. 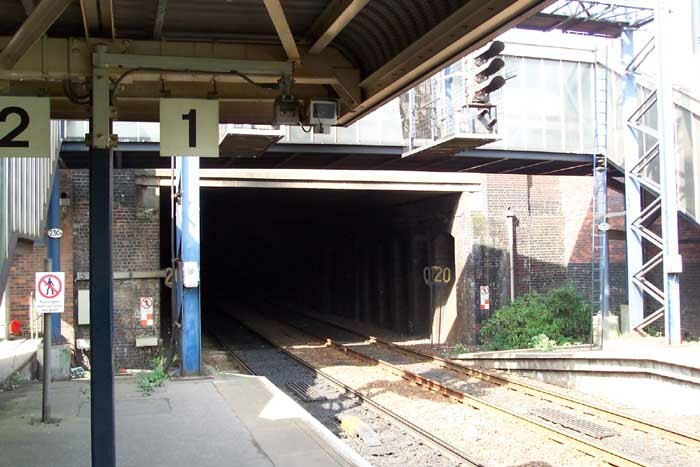 The closure of the old station came in 1987 with the opening of a new 'version' comprising of two platforms on the lines that directly entered the tunnel to Snow Hill which reopened that year and a new entrance. 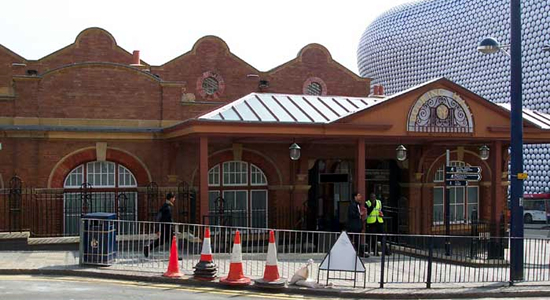 However, with the complete redevelopment of the Bull Ring Centre, the original Moor Street station has had a make-over and reopened this year with the station entrance opened in 1987 being decomishioned! 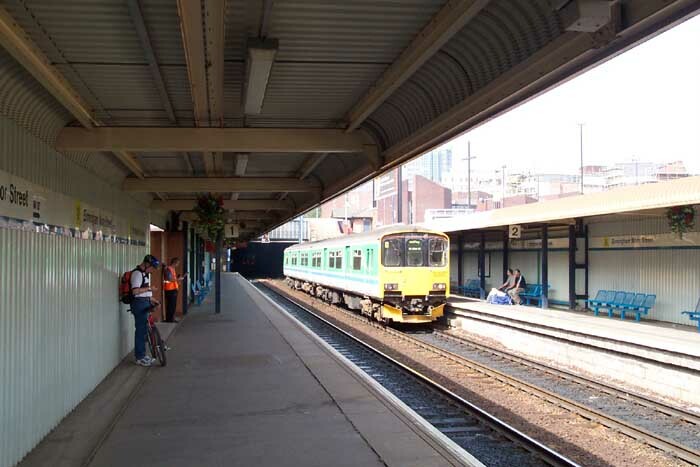 In the picture at the top of this page we can see the recently opened 'old station' which is to be operated by Chiltern Railways and offer steam trips using locos from the Tyseley Railway Museum. 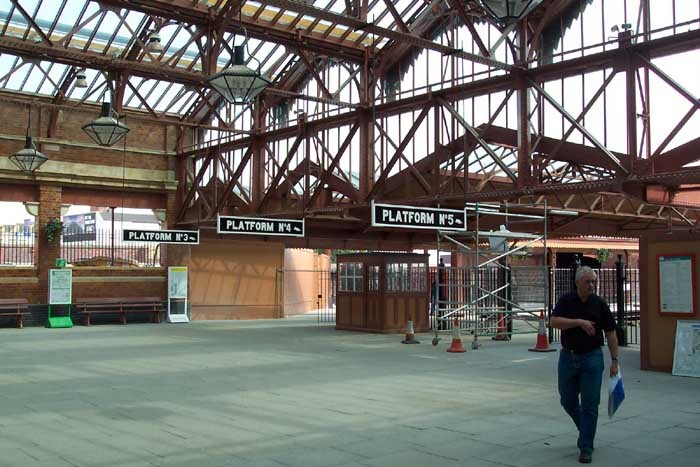 Above-left we could almost be stepping back in time as the refurbishment of the original Moor Street station building has paid attention to detail with GWR-style platform signs and various decor in the booking hall. Above-right we see the long-closed platforms being brought up-to-scratch and a steam loco at the end of the platform for good measure! 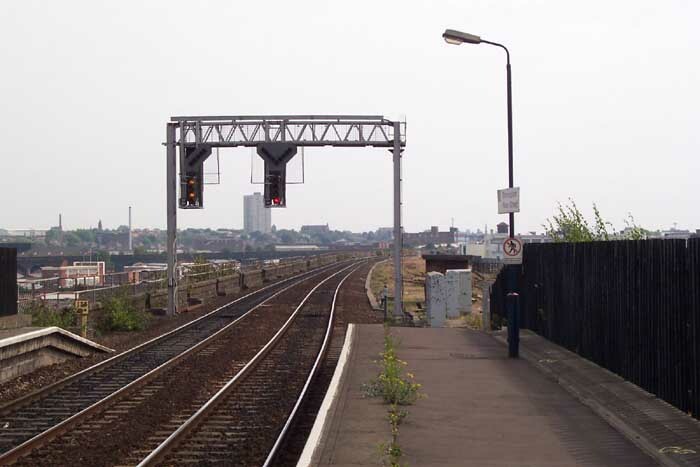 Interestingly, available space at the site was sufficiently restrictive to prevent the construction of a turntable and so, between the two lines seen to the right of the picture, a traverser was built to move locos from one line to the other - this, unfortunately, has not been reinstated. 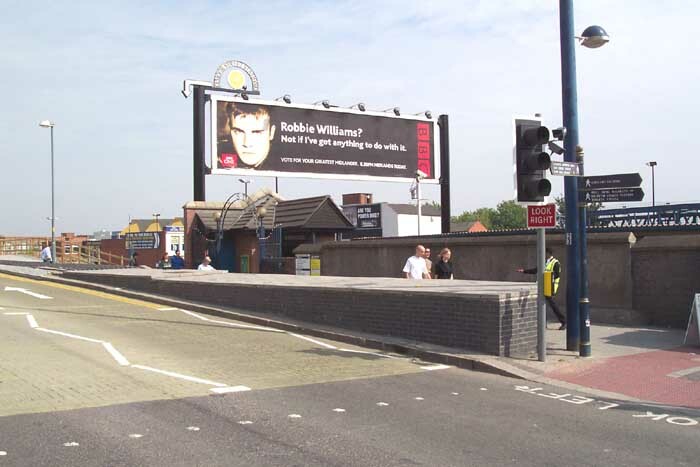 Above-left is the now disused entrance to Moor Street opened in 1987 directly on the through lines to Snow Hill station. Above-right we are looking into the mouth of the tunnel that passes under the city centre and arrives at Snow Hill station. Above-left we are on the same platform as the previous photograph but this time standing back from the tunnel entrance to see the two platforms used since 1987 for the through services to Snow Hill - the refurbished station and platforms are to the left of the photographer but are not yet in operation. Above-right we are in the same spot but this time looking away from the station towards Bordesley station - interestingly, just to the right of the photographer and out of shot is a water tower constructed for use by the proposed steam trips to be run from here in the near future: I told you it was like stepping back in time. It is nice, for once, to see some positive and 'in-keeping' development in the region's railways.